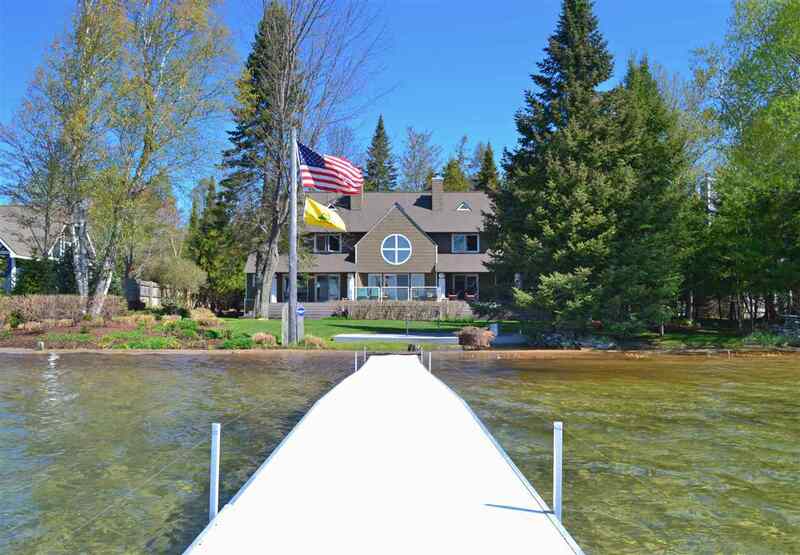 Midway between Boyne City, Charlevoix and Petoskey, and located on the sandy North Shore of Lake Charlevoix in historic Horton Bay, this magnificent waterfront home offers high quality in a comfortable size residence. Just steps from the water's edge and landscaped to please the senses all season long, this home features a full lakeside deck for entertaining or just watching the day go by. Architecturally designed with unique features and built in 1995 the home was completely remodeled in 2012 with a custom kitchen featuring Dutch Made Cabinets, green granite counters, Subzero refrigerator, Miele double convection ovens, Thermador "New Freedom" induction cook~top, Bosch dishwasher and Scotsman clear ice maker. Plenty of task and mood lighting make this a place to enjoy throughout the day. Walnut stained oak floors offer a warm substantial feel to the entire main level including the living, dining and family room area. Bask in the rainbows cast by a massive four panel circular leaded glass window and warm up to the two sided fireplace. The family room features built in book shelves, desk area, hidden storage areas and a dry bar for displaying your crystal collection. The second level is home to the master suite with walnut armoires and matching panels surrounding the gas fireplace. One of the bedrooms on this level was commandeered for a full dressing area while the other is overlooking the lake and grounds. Two more bedrooms and a bath are on the third floor. Connecting the main residence to the 4 car heated detached garage and carport is a hidden boardwalk lined with irrigated pots offering an inviting look year round. The garage offers floor drains and hot water for washing your car as well as full walls of workbenches to complete your tasks. Above the garage and carport is an additional 1200 sq ft of living space with built in cabinetry, track lighting for showcasing artwork, a half bath and another bedroom for overflow guests..